Phish fans were stuck on Interstate 91 on Friday afternoon. Traffic was at a standstill 15 miles south of the concert site. Torrential rain in the days leading up the concert turned Phish's Coventry event and its approaches into a muddy quagmire. Traffic was at a standstill on I-91, 15 miles south of the concert site in Coventry on the Friday, the day before the concert was to start. The traffic snarl was complicated by the fact that people who left their cars idling, ran out of gas miles from any gas station. Local Vermonters started selling gas to the fans for $8.00 per gallon. The fans, left without a means of garbage disposal, left their refuse by the roadside and used the interstate's nearby woods profusely. Clean up crews spent three or four days picking up the mess. Phish organizers were billed $35,000 by the State for the clean up. When concert organizers announced that the festival site could not accept any more vehicles because of the mud, approximately 15,000 fans abandoned their cars on the interstate and made their way by foot to the site overnight on Friday and Saturday morning. State police estimate that approximately 25,000 cars were left abandoned on I-91 and on Route 5. Some cars were able to park at local high schools. Many fans were given lifts in pick up trucks to the site. It was just as well as some of them had waited up to 20 hours to get into the concert site. Some complained that they had been ill informed by the site's "Bunny radio" which seemed more interested in promoting Phish than in providing useful information. If you have pictures of the actual concert, please send them to us for a Flash slide show. Contact us to make the arrangements. Those who reached Coventry found a sea of stinking mud. Those with cars and campers were towed into parking areas by farmers. Local tow truck operators reaped a bonanza. Those that arrived on foot, and who had not thought to bring rubber boots, were forced to leave their footwear in the mud! The mud stank, possibly because the land used for the concert had been sprayed with sewage from the Newport Sewage Plant a year previously. Normally, this would not have been a problem had it not been for the torrential rain. Concert organizers were aware of the spraying but had been assured that it would be safe. No one expected that the rain would stir things up so much. The actual concert days of Saturday and Sunday saw some pleasant weather and the performances went off without a hitch. Phish will donate $ 100,000 from the concert proceeds to social services organizations in Vermont. Most of the money will be given to agencies in the Northeast Kingdom where the concert took place.. The final estimate of the crowd was 65,000. Somewhat miraculously, their were few arrests and only one death reported - a suspected drug ovedose. For the most part, fans were polite and willing to accept the conditions. Vermonters in northeastern Vermont will remember this event and some no doubt will not wish for a repeat! This was the last concert by the Phish according to an announcement on the Phish Website. Phish is also trying to make it up to fans that never made it to the concert. Details are on the Phish web site. 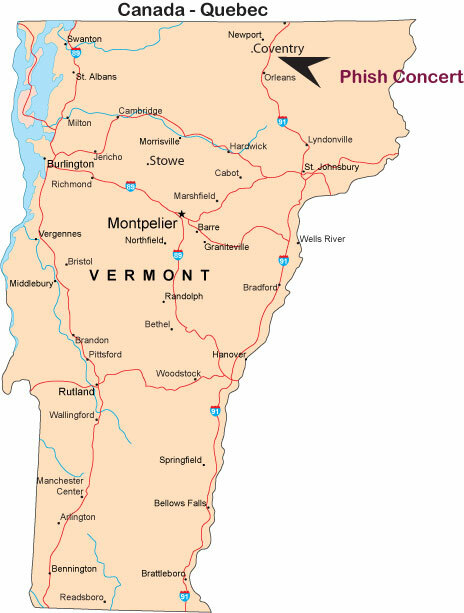 The Phish Concert in Coventry turned it into the largest "city" in Vermont in mid August.